Ah yes, Aberdeen, Scotland’s third city. The Granite City, the giant market town in the north-east of Scotland that all the little towns of Aberdeenshire look towards and whose inhabitants flock there when it’s a local holiday. Because it’s got the nearest big shops. Folk from Fraserburgh, Peterhead, Huntly...you could meet them all if you strolled down the main thoroughfare, Union Street, of a holiday Monday. No, wait a minute...that was Aberdeen in 1969. That was the city of old when its complacent outlook was summarised in the expression - whose origins I know not - ‘Tak awa Aiberdeen and twal mile roon aboot - an far are ye?’ (Take away Aberdeen and twelve miles / 19 km round about and what do you have left?) In those old days Aberdeen serviced the wee towns of Buchan, Formartine and Deeside- the other towns of Aberdeenshire - and felt itself terribly important for so doing. Then the oil came ashore and the city changed forever. New goods in the shop, new accents, new attitudes. And, true to form, lots of people, native Aberdonians and new folk, made lots of money. And all that started, oh, more than 40 years ago. True also, the wee towns of the shire changed as well, as did the countryside. Rural properties in that north-east corner of Scotland did well - if you are a ‘fortnight on and fortnight off’ - I mean, if you work offshore - it doesn’t matter so much where you live. And so everyone got on with earning a decent living. The city’s housing estates and the shopping malls expanded. Aberdeen and tourism. 1950 advertisement in city guide. (Pictured here) I found this advert in my favourite visitor guide to Aberdeen. It was published in 1950. (Click the picture of you’d like to read more of that gem of a publication.) Anyway, I assume that it was so dangerous to holiday in Aberdeen in those days that wreath makers found it advantageous to advertise here. So what did it matter that the dual carriageway (divided highway) from the south ended on an old bridge or two across the River Dee that squeezed the traffic to a standstill? What did it matter there was talk of a bypass that even now hasn't yet opened ? And what did it matter if the centre of the town began to look a bit seedy and run-down? Where was the centre of town anyway? Everyone was making money. It is as if the dull-headed local administrators didn’t have to exercise imagination or make any effort to coherently plan for the future. It was as if the only thing they had inherited from the previous generations of administrators was that same complacency of the comfortable market town: Aberdeen was different and important and, really, just had to do its own thing and ignore what was going on in other cities. Usually, it’s places of, uhmm, urban deprivation and decay that get nominated. But there goes Aberdeen, with its eye-watering house prices and its air of prosperity and low unemployment statistics...having the spotlight shone upon it because of its increasingly miserable downtown environment. Well, I’m not surprised. 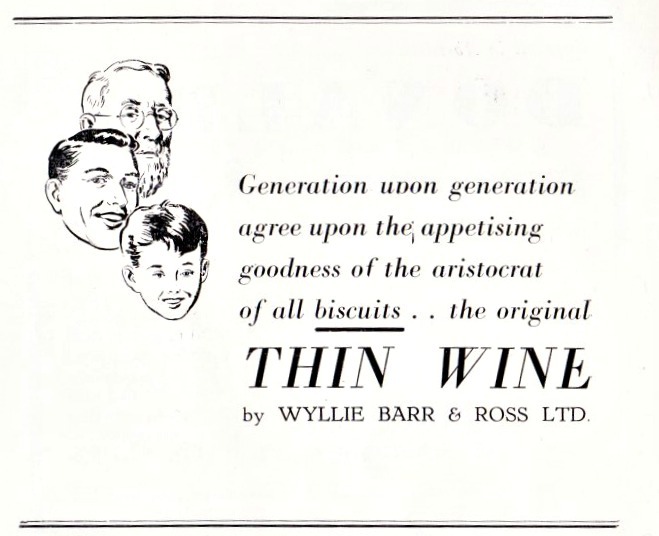 Thin wine biscuits were an Aberdeen speciality. No, only kidding. I think. (Pictured here) Thin wine biscuits? What? Were these once an Aberdeen speciality? Was the wine thin? Or the biscuit? What kind of hospitality was that?Another ad from that 1950 Aberdeen guidebook. Maybe if its local government officers and its local councillors had had a bit more imagination, it could have wakened up to the fact that it wasn’t like the central belt cities like Dundee, Glasgow or Edinburgh, or even like the slightly ‘Highland’ cities of Inverness, Stirling and Perth. No, Aberdeen, where you can hear the gulls over the sound of traffic, where the sea and harbour had brought it generations of prosperity, had a chance to really trade on its uniqueness. It could have branded itself as a North Sea rim city, with an air of, say, somewhere in Scandinavia perhaps. It could have made more of that silver-grey city centre (however you define it). But then, it didn’t have to. It just got on with making money. Glasgow redefined itself as a post-industrial city, Dundee busied itself with redeveloping its waterfront and attracting the Victoria and Albert Museum, for goodness sake...but Aberdeen...well, the oil will last forever, so the underlying attitude was that it didn’t have to do very much. And, oh joy, there's news (December 2014) from Airbnb, the informal accommodation website, that it's rating Aberdeen as the sixth-most expensive holiday resort, world-wide. What?! !